" We're fascinated with robots because they are reflections of ourselves." Student will learn basic of robotics, in which student will learn to create their own robots. STREAM Minds is a nice wonderful place with a good dedicated staff. My son is quite happy learning Robotics and 3D Printing there and proudly tells us what he did after each class. I am glad my daughter got to learn the fundamentals of Robotics and 3D printing at STREAM Minds. Although we are no longer living in India, she still fondly remembers her teachers and her classes well. She already knows more than her classmates in Robotics in her school in Singapore. StreamMinds is a best place for tinkering and exploring all around skills. 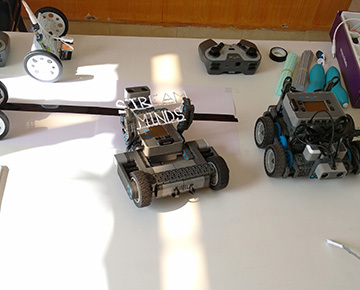 The concept of STREAM Minds is a first-of-its-kind welcome innovation to promote STREAM- Science, Technology, Reading/Writing, Arts and Mathematics education in India.